Whether leads at your life science tools and services company have been growing at a steady pace, or it’s been difficult to keep up with your goal of increasing lab sales, one market that no lab supplier should overlook is the Texas A&M, College Station market in southeast Texas. Biotechnology Calendar, Inc. organizes top of the line life science marketing events at Texas A&M on a yearly basis. The quality audiences that Biotechnology Calendar, Inc. events attracts, along with our specialized event staff, make for an enjoyable show experience where your sales staff can meet a higher percentage of leads in a professional, yet relaxed atmosphere. Why should you consider Texas A&M University in particular? In the 2014 fiscal year, Texas A&M University, College Station received $38.1 million in NIH funding. The highest funded department in 2014 which received research grants from the NIH was Biochemistry with 15 awards totaling $6.7 million. In 2013, the NSF awarded TAMU $17.8 million in life science funding. In 2013, Texas A&M’s total research expenditures were $820 million. Texas A&M University is also in the midst of a five-year grant totaling $176 million to fund research that focuses on the development of vaccines to respond quickly to flu pandemics. Texas A&M's 400-acre research park comprises 10 buildings and more than 500,000 square feet of lab and innovation space. Lab suppliers meet with life science researchers at the 2014 College Station BRPF™ Event. Take advantage of high lab sales potential at Texas A&M. 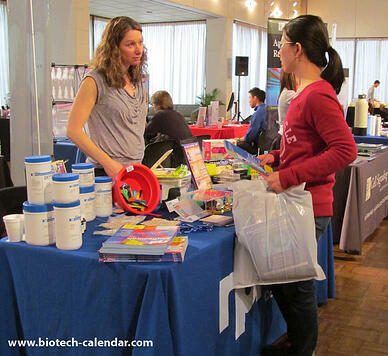 If you are a lab supplier who would like to market your lab products and services within a thriving research marketplace at Texas A&M University, Biotechnology Calendar, Inc. invites you to exhibit at the 14th annual BioResearch Product Faire™ Event at Texas A&M University on January 28th, 2015. 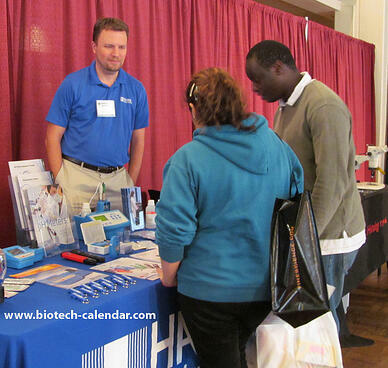 Last year, the BioResearch Product Faire™ Event at Texas A&M University attracted 175 attendees. Of these attendees, 33 were purchasing agents, professors and post docs, 33 were lab managers, and the remainder were graduate students and other lab staff. These attendees came from 31 different research buildings and 27 on-campus departments. To learn more about meeting face-to-face with life science researchers at other U.S. universities, please see the 2015 calendar of events. Click on the button below for comprehensive life science funding statistics on Texas A&M University and more information about the Texas A&M vendor show. Please visit the link below to learn more about exhibiting at the 2015 Texas A&M University BioResearch Product Faire™ Event.